Have you been thinking about using silk threads for a sampler? It is a good choice; silk was the thread most often used in sampler stitching over the last few centuries. It is strong, easy to use, and has a beautiful sheen. 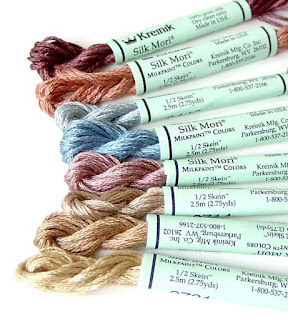 Kreinik Silk Mori (a floss), Silk Serica (a pearl-cotton-size), and Silk Bella (a super-fine size) are three different weight, or sizes, of silk thread available from Kreinik. You can get them on standard sized spools or large cones/skeins. They come in more than 175 colors. 2. 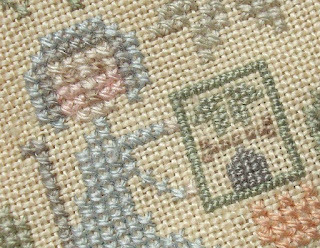 Narrow the 175 down to primitive, shaker, antique, or "sampler" style colors (see the list below) Print a copy and take it to your favorite independent needlework store, or visit one of the many online shops that carry Kreinik Silk Threads. Look for "half-skeins", or 2.5-meter skeins to start your collection. 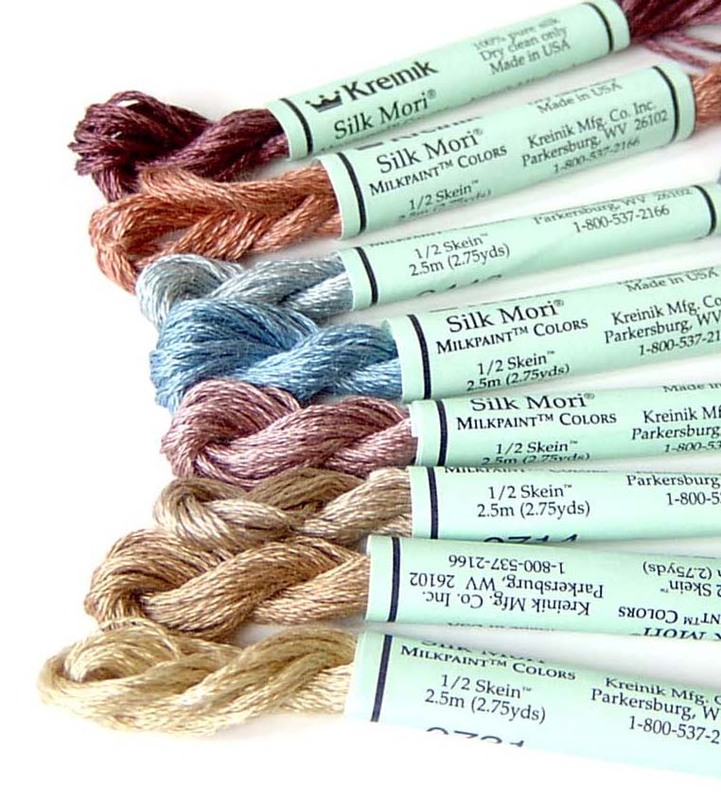 Choose these colors in Silk Mori for cross stitch, applique, and hand embroidery, or Silk Serica for Hardanger, needlepoint and crazy quilting. Note: Silk Bella is perfect for small details in all techniques, but doesn't come in as large of a color range as Mori and Serica. 3. 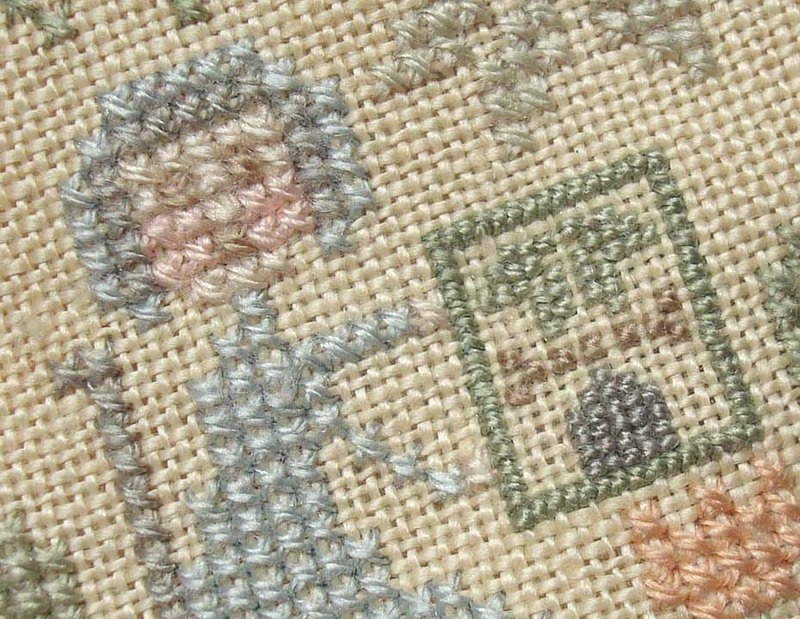 Get a silk color card and use it to match silk colors to an antique sampler. Then once you have your list, you can order just what you need. Here is the link to the Kreinik Silk Thread color card, which has actual thread swatches. Don't be intimidated by silk threads; stitchers have been using it successfully for centuries. Your fingers will be spoiled by its softness, your mind will be impressed at its strength and durability, and your eyes will delight at the beautiful, natural sheen. For the price of a small skein or spool of silk, it's worth a try. Here are some of the tips in response to the question, "How do you keep a metallic from breaking?" It looks like the most important factors are: adjusting tension, using shorter lengths, and making sure you have the right needle. Shorter threads and larger eyed needle - don't pull too tight and slow down — Bev F.
Use a larger needle so that the thread won't get worn from rubbing on the ground fabric. — Beth V.
Change your needle - your needle might have a burr in the eye that is wearing the metallic down and you might want to switch to a slightly larger needle - it'll make the hole bigger as you pass the thread through the fabric, making it easier for the metallic to pass through the fabric. — Erica K.
Short lengths, don't pull through the fabric too tight, and maybe a needle with a slightly wider eye…Be gentle and patient with it. — Steff W.
I use the Japanese needles with any of the metallic threads - the round eye helps with the fraying. Shorter lengths as previously said and keeping your fingers over the eye so the thread slips less. Then tension - then gentle but firm in your handling. — Robin B. Watch your tension - I've never had an issue with it breaking. Also use shorter lengths and Thread Heaven (thread conditioner). — Susanne C.
Thread Heaven, short lengths and let the thread "untwist" almost every stitch. — Judy K.
With Blending Filament, you can sometimes do all of the stitches without it and then just stitch the blending filament on top. Neat thing about that is that it really sparkles and it isn't twisted with the other thread. — Christine F.